Italy: Mussolini uses his Blackshirt combat legions to restore order after the murder of Socialist politician Giacomo Matteotti. Spain: Day 332 of 985 of the Spanish Civil War. During the night, most of the civilian inhabitants of Bilbao are evacuated by Basque forces. Spain: Day 697 of 985 of the Spanish Civil War. CBI - China: Day 342 of 2,987 of the 2nd Sino-Japanese War. Day 3 of 139 of the Battle of Wuhan. Japanese troops capture Anqing. CBI - China: Day 707 of 2,987 of the 2nd Sino-Japanese War. CBI - Mongolia: Day 34 of 129 of the Battle of Khalkhin Gol, a border dispute between the Soviet Union and Japan. Atlantic: German sub U-25 sinks the British armed merchant cruiser HMS SCOTSTOWN 80 miles west of Outer Hebrides, Scotland. ETO - France: Day 35 of 44 of the Battle of France. Italian planes attack the naval base at Toulon. Churchill turns down the French President's request for permission to seek an armistice with Germany. Eastern Front: Soviet troops begin massing on the borders of Latvia, Estonia and Lithuania. MTO - Italy: The British sub HMS ODIN is sunk by the Italian destroyer STRALE in the Gulf of Taranto. This is this war's first naval skirmish in the Mediterranean Sea. East Africa: Day 4 of 537 of Italy's East African campaign in the lands south of Egypt. PTO - New Zealand: The German raider ORION lays mines off Auckland. CBI - China: Day 1,073 of 2,987 of the 2nd Sino-Japanese War. Day 212 of 381 of the Battle of South Guangxi. Day 44 of 49 of the Battle of Yichang. Atlantic: German sub U-77 sinks the British ship TRESILLIAN 300 miles off Newfoundland, Canada. Atlantic: German sub U-107 sinks the Greek ship PANDIAS 300 miles north of the Azores islands. Atlantic: The Italian sub BRIN sinks the British ship DJURDJURA and the Greek ship EIRINI KYRIAKIDES 100 miles east of the Azores islands. Atlantic: German dive-bombers sink the Great Western Railway's steamer ST PATRICK near Fishguard, killing 29 people. This British company provided travel service from the main island to the surrounding areas such as Ireland, the Channel Islands and France. ETO - UK: The Luftwaffe bombs the British naval base at Chatham, but with little success. Soviet Union: The Russian news agency Tass, denies there is a German threat on its borders and calls such rumors "absurd and obviously sheer hostile propaganda." MTO - Libya: Day 65 of 256 of the Siege of Tobruk. Middle East: Day 6 of 37 of the Battle for Syria and Lebanon. Vichy French troops hold up the Australian 7th Division at Jezzine in the southern French Mandate of Syria and Lebanon. East Africa: Day 369 of 537 of Italy's East African campaign in the lands south of Egypt. CBI - China: Day 1,438 of 2,987 of the 2nd Sino-Japanese War. PTO - Japan: The Russo-Japanese trade agreement is announced in Tokyo. USA: President Roosevelt authorizes the creation of the US Office on War Information (OWI) and the Office of Strategic Services (OSS). He appoints CBS commentator and novelist Elmer Holmes Davis as the OWI's first director. Atlantic: Day 151 of 169 of Germany's Second "Happy Time," during which U-boats sink 609 Allied ships with little risk. US Coast Guard Cutter USS THETIS attacks and sinks U-157 southwest of Key West, Florida. Germany: The first launch of an A-4 rocket is achieved at Peenemünde, Germany, but after only 54 seconds the motor cuts out and the missile falls into the sea less than a mile away from its launch pad. Russian Front - North: Day 279 of 872 of the Siege of Leningrad. Russian Front - North: Day 40 of 658 of the Siege of the Kholm Pocket. Russian Front - Center: Day 16 of 31 of Operation KREMLIN, a German diversion to trick the Soviets into thinking Moscow is their main objective instead of Stalingrad and the Caucasus. Russian Front - South: Day 227 of 248 of the Siege of Sevastopol, Crimean Peninsula. The Luftwaffe sinks some of the Soviet ships, boats and barges that are bringing in supplies and reinforcements. MTO - Libya: Day 19 of 27 of the Battle of Gazala. Heavy casualties are inflicted near Tobruk as German tanks destroy 138 of the 213 British tanks. East Africa: Day 40 of 186 of the Battle of Madagascar. CBI - China: Day 1,803 of 2,987 of the 2nd Sino-Japanese War. Day 30 of 124 of Japan's Zhejiang-Jiangxi Campaign, launched to punish anyone suspected of aiding the Doolittle raiders in China. Roughly 250,000 Chinese will be killed. PTO - Alaska: Day 7 of 435 of the Battle of Kiska, Aleutian Islands. US 11th Air Force B-17s and B-24s bomb shipping in the harbor at Kiska Island. PTO - Malaya: Day 115 of 357 of the Battle of Timor Island. PTO - New Guinea: US 5th Air Force bombs the airfields at Rabaul. ETO - UK: British night fighter ace and Wing Commander John Cunningham brings down his 16th victim over southern England. ETO - Germany: US 8th Air Force B-17s bomb the U-boat yards at Bremen. Russian Front - North: Day 644 of 872 of the Siege of Leningrad. Russian Front - North: Day 405 of 658 of the Siege of the Kholm Pocket. MTO - Italy: US 9th Air Force US and RAF heavy bombers attack Catania and Gerbini Airfields in Sicily. CBI - Burma: US 10th Air Force attacks the Meza railway bridge on the Mandalay-Myitkyina line. CBI - China: Day 2,168 of 2,987 of the 2nd Sino-Japanese War. US 14th Air Force bombs hangars and the depot area at Nanchang Airfield. PTO: Day 18 of 47 adrift in a raft for the survivors of B-24 GREEN HORNET that crashed 850 miles from Hawaii. PTO - Alaska: Day 372 of 435 of the Battle of Kiska, Aleutian Islands. PTO - New Guinea: Day 53 of 148 of the 2nd Battle of Lae-Salamaua. US 5th and 13th Air Forces provide air support. PTO - Solomon Islands: A contingent of US Army, US Navy and US Marine Corps officers are landed at Segi, New Georgia, to evaluate possible landing locations for an invasion. PTO - Solomon Islands: US 13th Air Force bombs the Kahili Airfield on Bougainville Island. ETO - France: Day 8 of 49 of Operation OVERLORD, the Allied invasion of Normandy, France, known forever simply as D-Day. 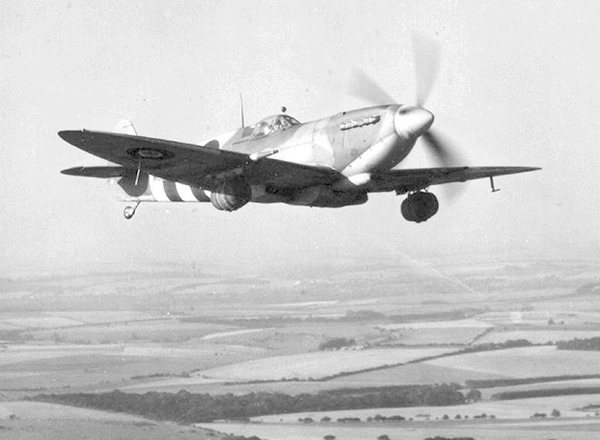 D-Day+7: An English brewery donates a sizable amount of fresh beer for the troops fighting in Normandy and a unique delivery method is created, strapping kegs to the underwings of Spitfires being shipped to forward airfields. Flying at 12,000 feet would chill the brew to perfection. The troops loved it, but the British Ministry of Revenue and Excise stepped in and informed the brewer that it is in violation of law to export beer without paying taxes on it. End of "authorized" beer runs. Nazis in France had been known to foul the local drinking water, so the beer was more than just a refreshing reminder of home. 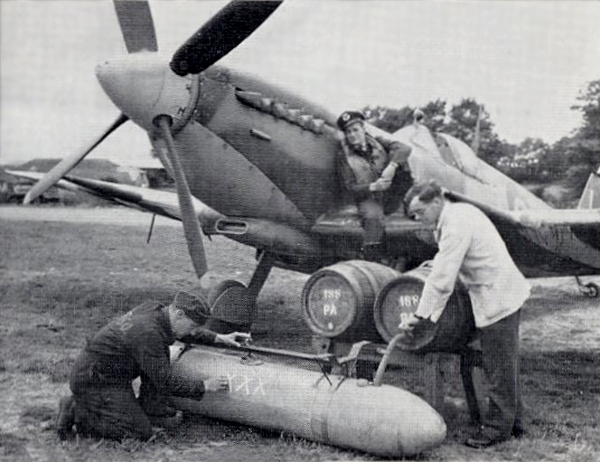 Another unique delivery method used auxiliary fuel tanks (normally dropped during long range combat missions) which were steamed out and filled with the brew, which held a lot more than the strapped on kegs. Although the beer runs were terminated for tax reasons, various enterprising squadrons found unofficial ways to refurbish their stocks. ETO - UK: Day 1 of 86 of the V-1 "Buzz Bomb" offensive on Britain. Germany makes its first V-1 Flying Bomb attack on England, hitting Swanscombe in Kent. Only four of the eleven bombs actually hit targets of consequence. Taken aback, news of this new weapon will be suppressed for the next six days. The V-1 "Buzz Bomb" offensive on Britain will continuously attack London for 86 days until 06 Sep 44. ETO - France: Day 8 of 62 of the Battle of Caen. Near Villers-Bocage, a single Tiger tank destroys 25 tanks and other vehicles of the British 7th Armored Division. ETO - France: Day 8 of 25 of the Battle of Cherbourg. Day 4 of 5 of the Battle of Carentan. German troops launch a counter-attack. Russian Front - Finland: Day 4 of 11 of the Battle of Vyborg. The Soviets continue their offensive against the Finns on the Karelian Isthmus, north of Leningrad. Russian Front - North: Day 133 of 191 of the Battle of the Narva Isthmus, Estonia. Both German and Soviet troops remain locked in their defensive positions. MTO - Italy: Day 9 of 16 of the Battle of the Trasimene Line (north of Rome). Allied Air Forces provide air support. The British 8th Army reaches Terni. CBI - Burma: Day 101 of 166 of the UK's Operation THURSDAY. Monsoon season bogs down all operations. CBI - Burma: Day 96 of 147 of the Battle of Myitkyina. US 10th Air Force provides air support. Monsoon season bogs down all operations. CBI - Burma: Day 74 of 302 of the Chinese Salween Offensive. US 14th Air Force provides air support. Monsoon season bogs down all operations. CBI - China: Day 2,534 of 2,987 of the 2nd Sino-Japanese War. Day 58 of 259 of Japan's Operation ICHI-GO. CBI - India: Day 98 of 118 of the Battle of Imphal-Kohima. PTO - Caroline Islands: US 7th Air Force bombs targets in the Truk Atoll and Ponape Island during the night. During the day, they attack Nauru and Ponape Islands. PTO - New Guinea: Day 18 of 83 of the Battle of Biak. 5th Air Force provides air support. PTO - New Guinea: Day 182 of 597 of the Battle of New Britain. US 13th Air Force provides air support. PTO - New Guinea: Day 53 of 481 of the Battle of Western New Guinea. 5th Air Force provides air support. PTO - Solomon Islands: Day 226 of 295 of the Battle of the Bougainville Islands. US 13th Air Force provides air support. CBI - China: Day 2,899 of 2,987 of the 2nd Sino-Japanese War. Day 74 of 91 of the Battle of Zhijiang. US 14th Air Force provides air support. Japanese troops continue pulling out of China. PTO - Borneo: Day 4 of 67 of the Battle of North Borneo. US and Australian troops enter Brunei. PTO - Caroline Islands: US 7th Air Force bombs the airfield on Moen Island, Truk Atoll. PTO - Dutch East Indies: Day 44 of 52 of the Battle of Tarakan Island. PTO - Japan: Day 74 of 83 of the Battle of Okinawa. PTO - New Guinea: Day 534 of 597 of the Battle of New Britain. US 10th Air Force provides air support. PTO - New Guinea: Day 418 of 481 of the Battle of Western New Guinea. US 10th Air Force provides air support. PTO - Philippines: Day 236 of 299 of the 2nd Battle of the Philippines, aka the Liberation of the Philippines or the Philippines Campaign. PTO - Philippines: Day 181 of 244 of the Battle of Luzon. 5th Air Force provides air support. The USS MISSOURI bombards several Japanese positions. PTO - Philippines: Day 96 of 159 of the Battle of Mindanao Island. 5th Air Force provides air support. PTO - Philippines: Day 88 of 135 of the Battle of the Visayas region. US 5th and 7th Air Forces provide air support.